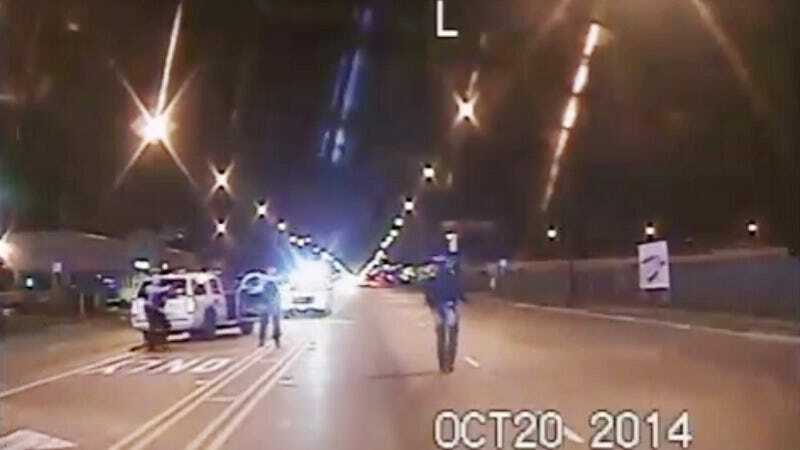 Earlier today, Chicago officials released a dashcam video showing the brutal shooting death of 17-year-old Laquan McDonald. The video was released after a judge ordered the footage be released to the public. In a grainy, soundless video, which opens with a long segment of a police car driving to the scene, McDonald can be seen running and walking past officers in the middle of the street. He is suddenly struck by bullets and falls to the ground. As he lays on the ground, still moving, it appears that he’s shot again and again. An officer appears to kick something out of McDonald’s hand. None of the officers offers any aid. Officer Van Dyke started shooting less than 30 seconds after arriving at the scene, the prosecutor said, and he fired for 14 or 15 seconds. For 13 of those seconds... Mr. McDonald was already on the ground. Witnesses said Mr. McDonald, who was carrying a folding knife, never spoke to Officer Van Dyke nor did he do anything threatening toward him. Van Dyke is currently being held without bail. In a press conference accompanying the release of the video Chicago mayor Rahm Emanuel said, “It is now the time to come together as one city, show respect for one another.” Emanuel and city leadership have faced intense criticism for waiting over a year to charge the officer with the teen’s death.